>The title of this blog is “Shouts from the Couch,” but I’ve not been particularly angry lately. In fact, if anything, the title now feels like it comes from a lazy couch potato who requires immediate assistance in reaching the bowl of onion dip that lies just out of arm’s reach. Speaking of reach, I finished the Halo Reach campaign on Friday, and have now officially dipped my toes into the sordid world of multiplayer. And as much as it hurts me to admit, I must say: I am enjoying the mulitplayer immensely. I’ve even won a few matches! (Only a few.) I’m never going to be very good at Halo; indeed, most of the time I’m just barely competent. But they’ve got so much to do in there that it borders on the absurd. Most importantly, their matchmaking search criteria is fantastic this time around; I’ve only played 12 matches thus far, but I’ve yet to run into any racist assholes, and for the most part I’ve never felt like I was playing with people a million times better than me – which is to say that I’ve got noone to blame for my failure besides myself. Which is just the way I like it. And the new Points system is a fantastic incentive to keep playing, which is odd, considering that the only thing you can do with your accumulated points is to buy purely cosmetic changes to your armor, which you can’t even see. I think my problem with the Halo franchise is that because I’ve never been interested in the multiplayer, I’ve really only been able to base my opinion on each product on the strength of its campaign, and let’s face it – their campaigns are all pretty stupid. 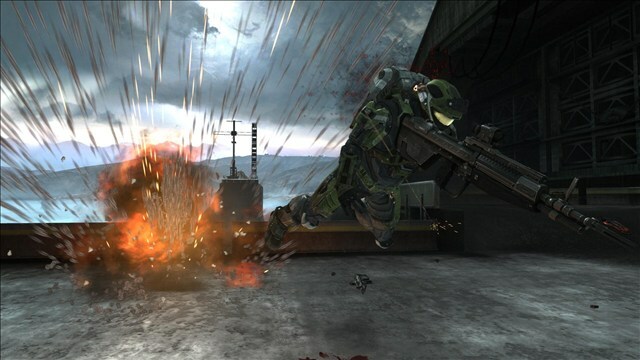 Reach is certainly paced well enough, and the enemy A.I. is quite devious at times and there are lots of memorable set pieces, but by and large the story is forgettable, the characters are interchangeable and hard to root for, and I frequently lost track of why I was going from point A to point B. There’s almost no backtracking in Reach, at least, so chalk that one up as a small victory. And it definitely looks good. Great, even. Definitely the best-looking Halo game yet. But it’s definitely not the best-looking game on the 360, not by a long shot. It’s not necessarily a knock – it doesn’t look bad – but there’s a reason why everyone licenses the Unreal engine, and why nobody licenses the Halo engine. It’s almost a shame that Civ V comes out tomorrow; I’d really like to keep playing Halo. And that’s something I’d never think I’d ever say.